Blyth Spartans defender Nathan Buddle. 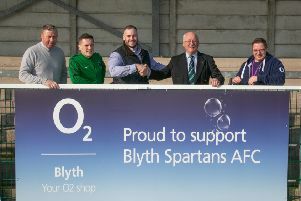 Blyth Spartans defender Nathan Buddle wants his side to mount a serious play-off push after taking four points from two off the Evo-Stik Northern Premier League’s in-form sides. Saturday’s impressive win over Curzon Ashton was quickly followed by a last gasp draw at an Ilkeston side who were 16 games unbeaten going into the New Manor Ground fixture. They were two results Buddle hailed as “a great start” to their play-off push as they embark on a hectic schedule between now and late April. He said: “Before the Curzon Ashton game we were set a target by the management team and we know exactly what we have to do. Both games featured late goals from Spartans. Michael Richardson scored his first home goal for the club to seal three points against Curzon before Steven Turnbull’s maiden strike snatched a point in the 90th minute at Ilkeston. Buddle believes that both games showed the belief inside the Spartans squad and thinks that will be key between now and the end of the season. “We, as a team, never give up until the final whistle,” he added. “If we are behind we know we will always create a chance or two and we just have to take them. As Spartans went in search of an equaliser at Ilkeston, Buddle found himself in a rather unusual position. The former Hartlepool United centre back was asked to play as a striker for the last ten minutes but believes he might rue a chance that got away. With two minutes left on the clock a loose ball ran to Buddle 20 yards from goal and the defender smashed a shot goalwards. However, Ilkeston captain Joe Maguire managed to block his effort and Buddle joked that if the shot had gone in he may well have found himself as a regular in Spartans pool of strikers. He said: “I was surprised when I got the shout to go up top, but I just tried my best to cause them some problems. “I did have one chance and I am sure my shot was on its way in but it was blocked by their lad.